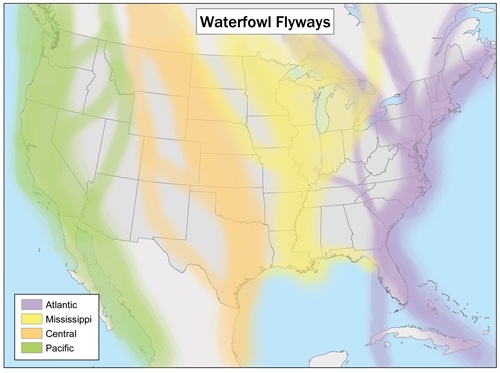 The four main flyways that migratory waterfowl follow during their migration. Migratory waterfowl in North America cover thousands of miles annually as they travel from the prairie pothole region in the north-central portion of the continent to their wintering grounds in the southern United States. During this migration, waterfowl encounter many different environments that each face their own unique challenges as a result of climate change. These birds follow distinct flight paths called flyways as they travel south to their wintering grounds. The four major flyways in North America are the Pacific, Central, Mississippi, and Atlantic. During the summer, the vast majority of the Mississippi flyway birds nest in the prairie pothole region, which is the largest nesting grounds for migratory waterfowl in North America. This region covers the vast prairie of Canada and portions of North and South Dakota, along with eastern Montana. During the winter months, these same birds populate the southern Mississippi River Valley and Delta, along with the Gulf of Mexico coast. The Northern Great Plains are home to the North American Prairie Pothole Region, which is the most important region for migratory waterfowl in North America. The potholes, which are small wetlands, exist in a landscape of grasslands and agriculture. The overall region covers a vast area of approximately 250,000 square miles (Dalton Westberg, 2017). This region is optimal habitat for breeding waterfowl, who use the grasslands for nesting and forage the wetlands for food (Westberg, 2017). It is estimated that nearly 70% of the wetlands have been lost in the region, with 84% of this loss attributed to agricultural development (Muhammad et al, 2018). This loss further heightens the importance of the Prairie Pothole Region due to the significant losses it has already suffered. Map showing the southern portion of the North American Prairie Pothole Region. The shading represents the projected number of days above 90 degrees Fahrenheit as a result of climate change. Analysis of mid-continent populations of mallards shows that 90% change in population growth rate is directly tied to breeding activities that occur in the pothole region (Westberg, 2017). If increases in drought occur as predicted, many of the small depressions that form potholes will likely be dry, leaving less suitable breeding opportunities for ducks. 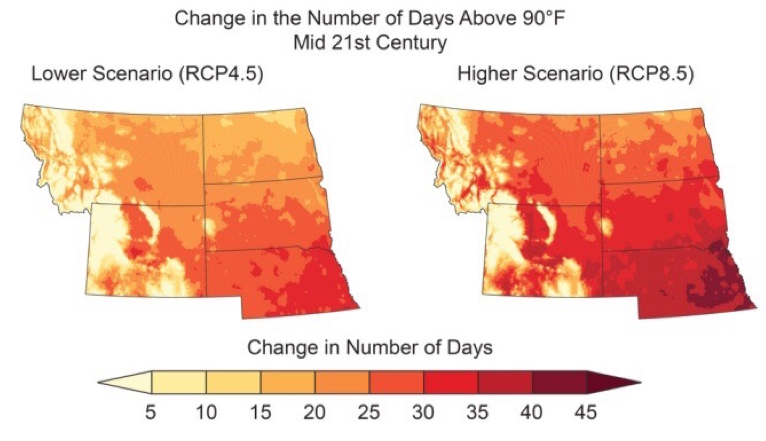 Figure 1 shows how the southern end of the pothole region can expect to see an increase of 20-35 days annually over 90 degrees Fahrenheit based upon projections (NCA Northern Great Plains, 2018). Extreme heat will accelerate the evaporation of wetland areas and diminish the health of the grasslands. This will lead to smaller spring broods and a decrease in successful nesting pairs. The pothole region is responsible for roughly 50% to 80% of North America’s migratory waterfowl (Westberg, 2017). Due to the importance of the region, these factors will slow the reproductive rate of North America’s waterfowl significantly. The Upper Mississippi River supports an estimated 36% of all continental migrating waterfowl in North America (Kenna et al, 2017). Perhaps the largest threat to waterfowl using the Mississippi River for migration is the risk of parasitic infection. The snail Bithynia tentaculata was first discovered in the Upper Mississippi River in 2002 (J. P. Peirce, 2016). The snail harbors an invasive parasite that is responsible for waterfowl mortality outbreaks on the river annually. 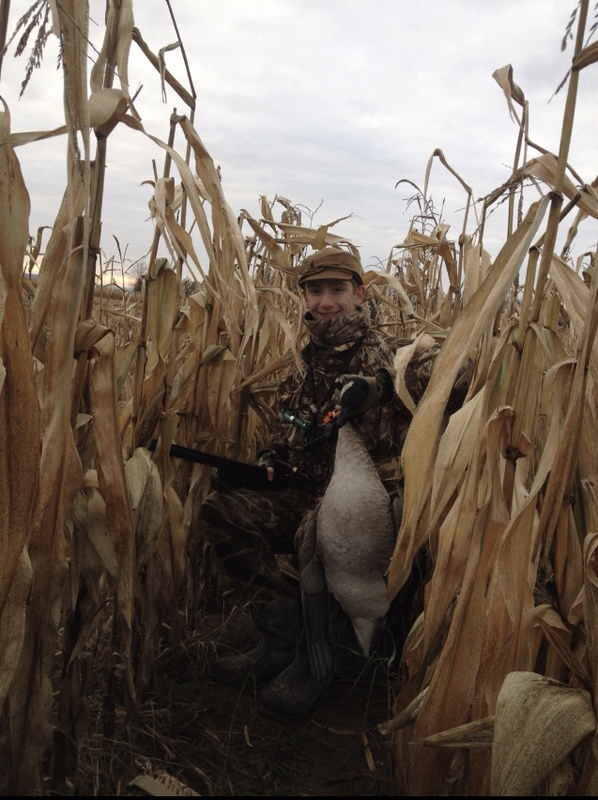 Due to a recent increase in warmer winters, the parasite has been responsible for an increasing number in waterfowl deaths during the spring and fall migrations (Peirce, 2016). The parasite infects diving waterfowl, who eat its carrier the Bithynia snail. Upon ingestion, the birds can die within three to eight days from blood loss, shock, or stomach infection (Upper Mississippi River National Wildlife and Fish Refuge, 2017). Normally, the waterfowl only briefly stop in the infected region of the Upper Mississippi River during their annual migration. This limits their contact with the infected snail and thus the parasites as well. However, due to a trend in warmer winters, the upper portion of the river does not experience as long a period of ice cover (Peirce, 2018). This results in the migrating waterfowl staging in the infected region for longer periods of time, leading to increasing annual mortalities. 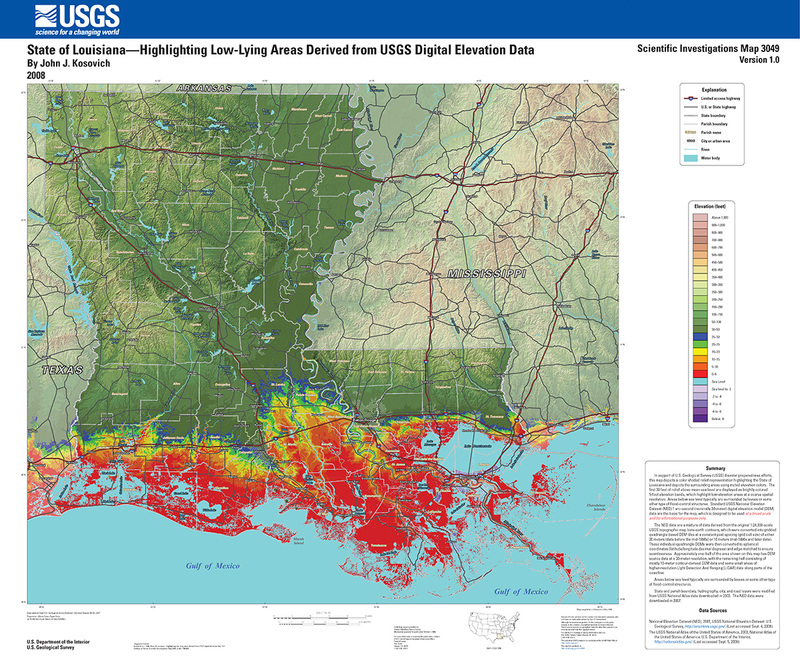 USGS Map showing Louisiana land susceptible to sea level rise in the Mississippi River Delta. The areas highlighted in red are less than 4 feet above sea level. The Mississippi River delta is a crucial wintering ground for millions of migratory waterfowl each year. Sea level rise poses a significant threat to waterfowl who rely on the marshes of southern Louisiana for habitat following their annual migration south. Between 1932 and 2016, Louisiana lost over 2,006 square miles of land due to rising sea levels (NCA Coastal Regions, 2018). This presents a major threat to waterfowl and the biodiversity of the marshes in the region. The rate of land loss to sea level rise is the equivalent of losing an area the size of a football field every 34 to 100 minutes (NCA Coastal Regions, 2018). Freshwater is imperative for the survival of migratory waterfowl. The aquatic vegetation and habitat that the marshes of the Mississippi delta provide are lost when saltwater intrudes further inland. Clay Darling grew up chasing ducks and geese around Northern Michigan, which has lead to a lifelong passion for the conservation of North America's migratory waterfowl. He graduated with a degree in Environmental Studies and Government from St. Lawrence University in 2019. United States, U.S. Global Change Research Program. (n.d.). Fourth National Climate Assessment (4th ed.). Washington, D.C.
Kenna, M., Hagy, H., McClain, S., Simpson, J., Osborn, J., Hine, C., . . . Yetter, A. (2017). True Metabolizable Energy of Submersed Aquatic Vegetation in Semi-Permanent Marshes for Dabbling Ducks in the Upper Midwest (Rep. No. 29). Champaign, IL: Illinois Natural History Survey. Mississippi River at La Crosse [National Weather Service Hydrograph]. (2019, February 27). La Crosse, Wisconsin. Visser, J., Broussard III, W., Shaffer, G., & Day, J. (2014). Climate Change Effects on the Ecology of the Mississippi River Delta. In Biochemical Dynamics at Large River-Coastal Interfaces: Linkages with Global Climate Change (pp. 421-438). Cambridge University Press. Westberg, D. (2017). The Effects of Climate Change on Migratory Waterfowl in the Pacific Flyway (Master's thesis, California State University, Sacramento, 2017). Sacramento.